During extensive repairs the aircraft was re-engined with an 80 h.p. Gnome and fitted with a divided elevator to accommodate a tall, high aspect ratio rudder with small fixed fins above and below the fuselage. It was then redesignated B.S.2, later changed to S.E.2, but within a few months the rudder was enlarged still more and the machine reappeared with a fabric covered strut-and-longeron rear fuselage. It was taken over by No. 5 Squadron, R.F.C. in January 1914 and also served with No. 3 Squadron at Netheravon. It was sent to Moyenneville, France in October 1914 and flew offensive patrols until March 1915. Armament consisted of two rifles mounted on the sides of the fuselage to fire outside the arc of the propeller. Construction: By the Royal Aircraft Factory, Farnborough, Hants. Dimensions: Span 27 ft. 6 in. Length 22 ft. 0 in. Weights: All-up weight 1,230 lb. Maximum speed 85 m.p.h. Landing speed 47 m.p.h. Initial climb 700 ft. min. Following its crash in March 1913, the B.S.1 (which see) was rebuilt at a cost of around ?900. Various minor improvements were incorporated, and at the same time it was redesignated S.E.2, S.E. standing for 'Scouting Experimental'. The only apparent changes from its predecessor were a new tail unit and a revised engine cowling enclosing the 80hp single-row Gnome which replaced the 100hp two-row unit previously fitted. The new tail had symmetrical ventral and dorsal fins, inversely tapered elevators hinged from a semi-circular tailplane, and a high-aspect-ratio rudder, considerably larger than the previous one, which had its bottom edge steel-shod to serve as a tailskid. The undercarriage and wing structure were unchanged, as was the divided tank holding both petrol and oil. The rebuild was completed by October, several months later than O'Gorman had hoped. Again Geoffrey de Havilland acted as test pilot, although at least one RFC officer had flown the machine by 5 November, when O'Gorman reported on its performance to the Assistant Director of Military Aeronautics at the War Office. His report stated that the lower power of the smaller engine was compensated for by its reduced weight, and that the S.E.2's climb and maximum speed were nearly as good as those of the B.S.1. Its stalling speed was lower. O'Gorman also commented that the monocoque fuselage had proved expensive and slow to build, and suggested that he could make a conventional wire-braced structure at least as strong for the same weight. A request to be allowed to retain the machine for continued trials was refused, and on 23 December the Factory was instructed to hand it over to the RFC. On 1 January 1914 O'Gorman replied, explaining that the machine was awaiting the replacement of a broken skid, and emphasizing that the S.E.2 was an experimental design and not suited for service use. He also drew attention to a number of defects, which included cracked engine cowls, and suggested that it should remain in the Farnborough vicinity so that it could be attended to whenever necessary. Despite his protests the S.E.2 was handed to 5 Squadron on 17 January, and was allotted the serial 609. Service pilots found it easy to fly and not difficult to land, although its shallow gliding angle made it hard to get into any field surrounded by trees unless it was very large. The view of the ground from the cockpit was described as good, but the forward view was considered impossible when the nose was raised in taxying or climbing. Early in April the S.E.2 was returned to the Factory for modification and repair. The monocoque fuselage was replaced by a conventional structure of four longerons, wire-braced and faired to circular section by formers and stringers, as previously suggested by O'Gorman. The engine cowling was again modified, and a new tail, similar to that designed for the S.E.4, was fitted. The wing structure was unchanged, but the bracing wires were replaced by Farnborough's new streamlined 'Raf wires'. 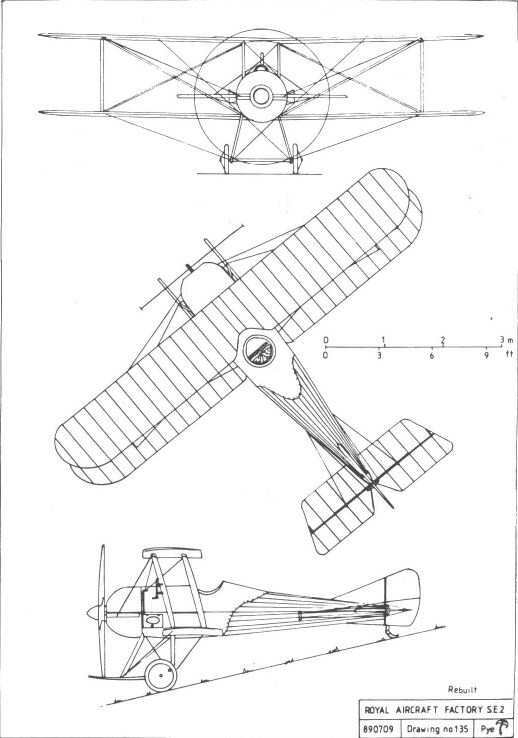 Although the designation S.E.2a has often been applied to this version, no official or contemporary use of this suffix can be traced, the surviving Factory drawings referring to this version as the 'S.E.2 rebuilt'. The modifications were completed by 3 October and, owing to the needs of war, after very brief tests at the hands of Frank Goodden the aircraft was returned to the RFC, joining 3 Squadron in France on 27 October. Never armed with more than service rifles, the S.E.2 remained a high-speed reconnaissance aeroplane, a true 'Scout'. Its eventual fate is unknown. max speed 85mph at sea level. Conceived by Mervyn O'Gorman as a continuation of the B.S.1/S.E.2 formula, but powered by a nine-cylinder Gnome rotary of 100hp, the S.E.3 was shelved, after some preliminary design work by H P Eolland, in favour of the more advanced S.E.4. It was to have been an unstaggered biplane with single interplane T struts. Its ailerons could also act together as landing flaps, or could be reflexed to reduce resistance in high-speed flight. S.E.2. Two rifles, one on each side of the fuselage, pointing outwards to clear the airscrew, appear to have formed the earliest armament of this single-seater. These were later discarded, and only a pistol was then carried. The BS.1, which crashed on 27 March 1913, had by that time been reidentified as the SE.2. However, approval for its reconstruction was given, within a cost of .900, and so the opportunity was taken to carry out a number of design changes. Among these was the fitting of an 80hp Gnome engine in a new circular cowling and a completely new tail unit. The latter consisted of small triangular fin surfaces, above and below the fuselage datum, with a high aspect ratio rudder, having a reinforced lower edge member, serving as a tail skid. The new vertical surfaces necessitated the fitting of a divided tailplane and elevators. In this form the SE.2 was flown by de Havilland in October 1913 and was retained by the Factory until instructions to release it to the Military Wing caused it to be handed over on 17 January 1914, becoming No.609, before being returned to Farnborough in April for further modification. This rebuild included the replacement of the rear fuselage monocoque with a conventional wooden girder of four longerons, with formers and stringers fairing the outside shape. The tail unit was changed to provide a larger fin and rudder and there were new tailplane and elevators. The engine was enclosed in a new cowling, tapering steeply from its largest diameter down towards the propeller boss, and rearwards to align with the fuselage shape. A small spinner was fitted. All external bracing was made of streamlined section wires known as Rafwires, the first use of these, which were adopted extensively. Frank Goodden flew the rebuilt SE.2 on 3 October 1914 and it was soon serving with No.3 Squadron in France armed with two rifles. It was returned to England in March 1915 and no further details of its use are known. This was a project for a development of the SE.2, with the more powerful 100hp Gnome nine-cylinder engine, for which some preliminary design work was carried out by HP Folland. 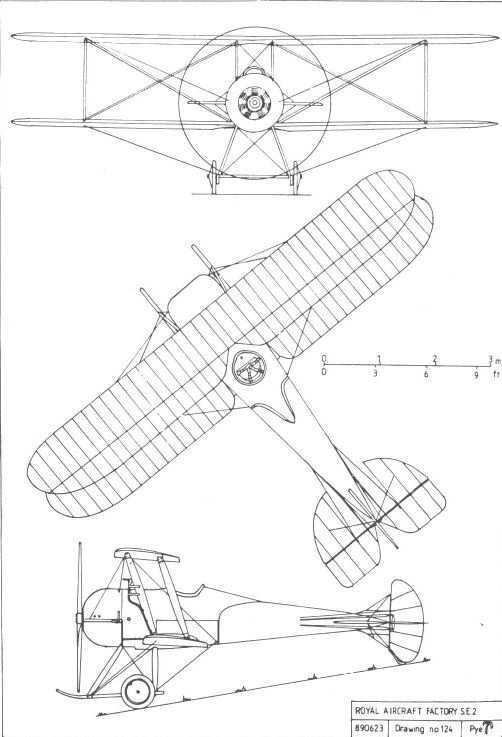 It was to be an unstaggered biplane with single I-shaped interplane struts and with ailerons usable as either flaps or airbrakes. The lack of sufficient rear vertical area was rectified when the machine was rebuilt, and small fins were mounted above and below the fuselage, together with a new larger rudder and divided elevators. A lower-powered nine-cylinder 80 h.p. Gnome took the place of the original engine, and the propeller was replaced by one of smaller diameter and finer pitch. For a short time the rebuilt B.S.1 was designated the B.S.2. It was then renamed S.E.2, the S.E. signifying Scouting Experimental in place of the earlier Santos Experimental. The S.E.2, known also as "The Bullet", was a better flying machine, but the lower power naturally resulted in a reduced performance, the top speed falling to 85 m.p.h. Later in 1913 the S.E.2 was taken into the workshops to be modified once again. In its final form as the S.E.2a, a new rear fuselage of fabric-covered stringer type was incorporated in place of the monocoque. Once more the fin and rudder were increased in size, but the original wings with their warping lateral control were retained, together with the two-wheel undercarriage and its pair of skids. 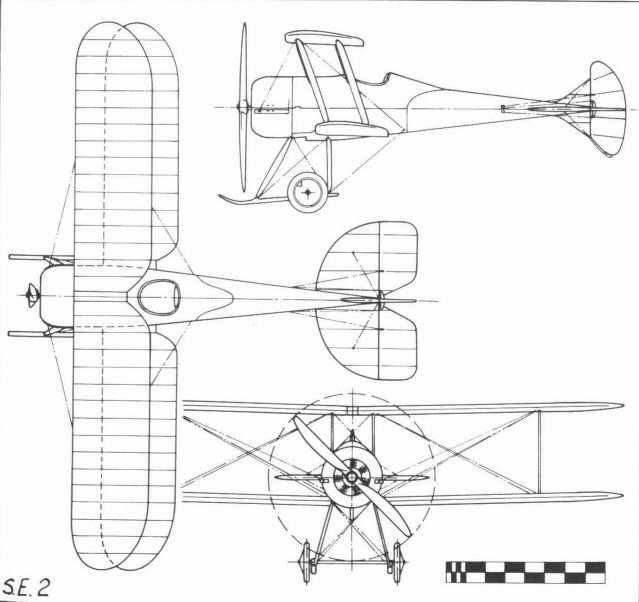 In January, 1914, the S.E.2a, as No. 609, was taken on to the strength of No. 5 Squadron, R.F.C. 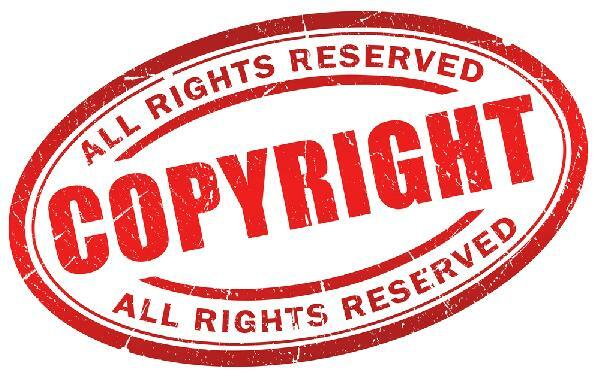 During the following October it was sent to France to be used operationally by No. 3 Squadron, R.F.C., on the Western Front, its armament consisting of the pilot's .45 cal. revolver and a rifle mounted on each side of the fuselage to clear the propeller. In March, 1915, the S.E.2a's employment against the enemy came to an end with its return to England. A further modification of the design to be known as the S.E.3 was not proceeded with. 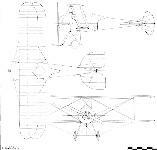 Description: Single-seat tractor biplane scout. Wooden structure, fabric covered. Manufacturers: Royal Aircraft Factory, Farnborough, Hants. Power Plant: 80 h.p. Gnome. Dimensions: Span, 27 ft. 6 ins. Length, 22 ft. Performance: Maximum speed, 85 m.p.h. Landing speed, 47 m.p.h. Climb, 700 ft./ min. The S.E.2 was a rebuild of the unarmed B.S.l, which was designed at Farnborough by Geoffrey de Havilland assisted by H P Folland and S J Waters, and flown in early 1913. 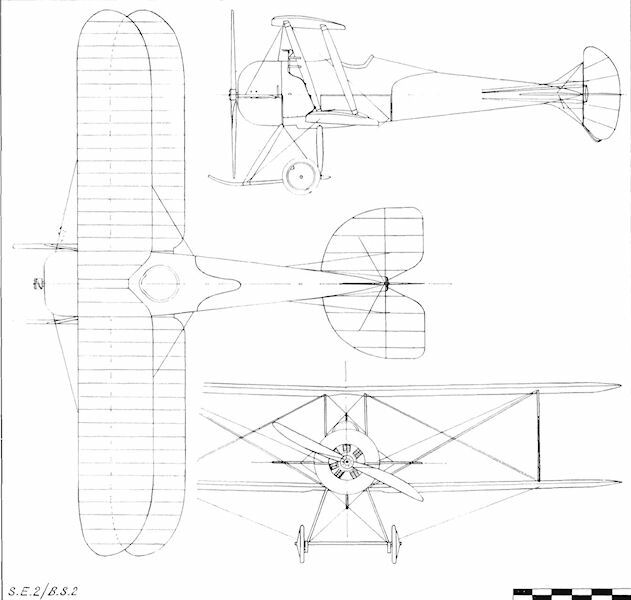 Designated as a ‘‘Bleriot Scout”, the B.S.l was an attractive single-bay equi-span biplane with a circular-section fuselage which was of monocoque construction aft of the single-seat cockpit. Power was provided by a partially-cowled 100 hp Gnome rotary engine. The B.S.l achieved 92 mph (148 km/h) and a climb rate of 900 ft/min (4,6 m/sec) in early tests, but was badly damaged on 27 March 1913. It was then rebuilt with a redesigned tail unit that included a semicircular tailplane with a lifting profile, divided elevators, a small fin and large rudder. 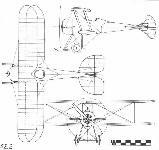 With a fully-cowled 80 hp Gnome nine-cylinder rotary engine, the aircraft flew again in October 1913, being redesignated S.E.2 as a Scouting Experimental (although the S.E. series had earlier been intended for ‘‘Santos Experimental”, of canard configuration). RFC handling trials took place (with No 5 Squadron) early in 1914, after which the S.E.2 was again rebuilt, with a more conventional rear fuselage of wooden construction and fabric covering, larger fin and rudder, constant-chord tailplane and other smaller changes. Taken to France (by No 3 Squadron) later in 1914, the S.E.2 was fitted with two Army rifles firing at outward angles to clear the propeller, and other (revolver) armament was also tried during the several months it remained with the squadron. Max speed, 85 mph (137 km/h) at sea level. Empty weight, 720 lb (327 kg). Loaded weight, 1,132 lb (513 kg). Span, 27 ft 6 in (8,38 m). Length, 20 ft 5 in (6,22 m). Height, 9 ft 316 in (2,83 m). Wing area, 188 sq ft (17,47 m2). The S.E.2 on the edge of Farnborough Common, with Geoffrey de Havilland in the cockpit. RAF SE.2 was a reconstruction of the crashed BS.l which flew in October 1913. RAF SE.2a was transferred to the RFC in January 1914 and served in France armed with two rifles until March 1915. The rebuilt S.E.2, again seen on Farnborough Common, on 20 October 1914. 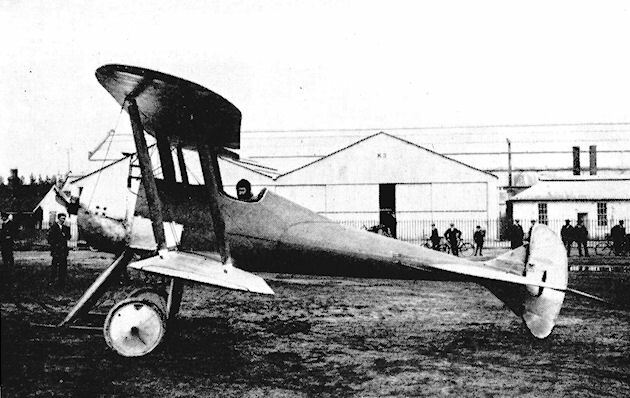 In its reconstructed form, the sole S.E.2 was used briefly in France with make shift armament. The rebuilt S.E.2 in service with the Royal Flying Corps.